Does your New Year’s resolutions lists include “be more creative?" What does that really mean? It probably means something different to each of us. If it’s on your list, have you thought about how you want to be more creative? How will you measure it and know if you’ve met your goal? Creativity comes in many forms. You’re probably already more creative than you realize or give yourself credit for. Often, creative is a label applied to people we consider artistic in some manner. People who create things must necessarily be creative. So, do you want to take a class to learn how to watercolor paint? Keep a new journal? Learn to sew? Learn how to take your crafting to a new level? Figure out how to approach DIY projects? Have time to just play with craft or art supplies? Write that novel that’s been on your mind? 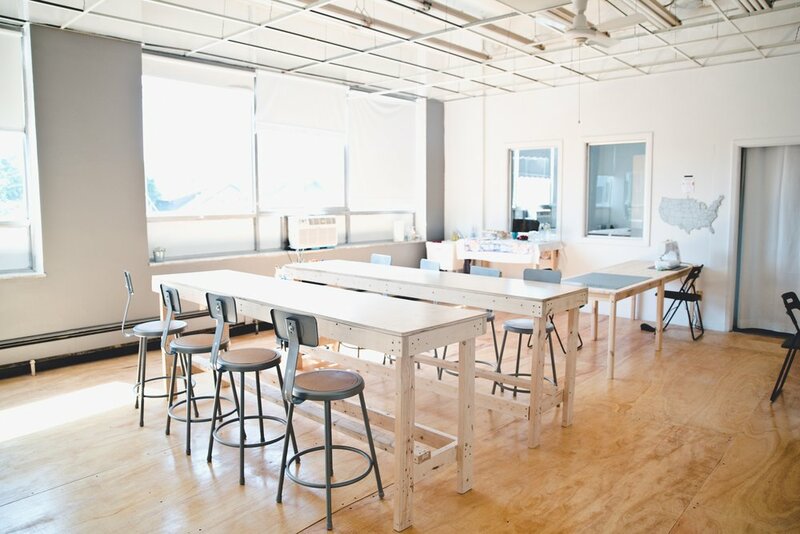 Empty Studio ready for creative thought and activity. What if you don’t “make” anything, but you come up with interesting new ideas about how to do things. This could be at work, at home, involving food, production, writing, entertaining kids, resolving conflict, or gasp, creative accounting (usually considered a bad kind of creative). You can be all kinds of creative in all these areas if you just relax and let yourself try new things. So, what kind of “more creative” do you seek? Here are my top five tips for carving out space for creativity in my mind and schedule. Do Nothing. For me, it’s usually about making time to do nothing but let my mind wander without interruptions for a few hours (this happens almost never). The best times for me to do this seem to be at night when I can’t sleep or during the day if I go for a run or hike. Those activities remove distractions like phone, computer, and kids. The exercise seems to really improve the idea flow. Hmm… Perhaps getting back into a regular running routine needs to go on my own goal list. Try New Things. Talk to new people. Do things outside your normal routine. When I do new things, I have a huge level of anxiety about getting started. I’m terrified of what will happen, all the negative what-ifs. But think of the good what-ifs. Let go of the anxiety and do it anyway. Every single new person, activity, encounter has helped expand my mind and add new creative ideas. Really. Sometimes I take this too far (quit stable job, have baby, start farm, quit farm, sell farm, move to new state and city, start new business). Just saying something friendly to someone in line at the store, going to a new store or restaurant, reading a book you would never consider reading, are all it takes to get the creativity going. It's like being a kid again. Or being a parent and saying yes to your kids silly ideas. Say Yes. If you tend to say no to activities outside regular work, church, school things, try saying yes. If it’s something new, you’ll have to get creative to figure out how to execute this new task you’ve agreed to do. If it’s a new activity, you’ll have to get creative figuring out how this new thing works. This could be as simple as saying yes to a lunch date, coffee with a friend, or taking a sewing class that a friend has been begging you to go to with her. “No” was my go to answer for so long. Then one day, I started saying yes sometimes. It wasn’t always comfortable, and sometimes the result was disappointing, awkward, or a bust, but I always learned something and had a new perspective opened to me, which leads to creative new thoughts! Say No. On the flip side of saying yes, sometimes you need to say no to be more creative. If you say yes to every single annoying request from any and everyone you will only give yourself the chance to be creative in fitting every single activity into your day, but that’s probably not the creative you were thinking about when you made your resolution. One of my best friends is the most giving and wonderful person. She says yes to everyone and feels uber guilt if she says no. She drives herself insane with all her sweet politeness and hard work for everyone but her. She feels overwhelmed and has no time to let her creative juices flow. She’s very creative when she gets the chance - she is an incredibly talented pastry chef and amazing with kids. Just think what she could do with a little more NO in her life. Make Something Ugly, Gross, Stupid, Pointless, Silly. Sometimes I agonize so long over wanting to make something just right that I end up making nothing at all. That’s not creative. When I let go of that need for perfection and make something just to try it and tell myself it’s just a test, practice, or an exercise, my mind relaxes and new ideas seem to come pouring forth when I see the results of the silly idea played out. It’s a great solution when I can’t seem to start anything. So, roll up your sleeves and do something that makes you feel creative. Exercise those creative muscles with time for you, making or doing something out of the ordinary, and make something silly or ugly. See what new creative avenues you open for yourself. Once you try one thing, it tends to snowball as all the creative directions open in your mind. Then the challenge will be choosing which creative activities to pursue first.